gives the array of pixel values in an Image or Image3D object image. gives the array of pixel values converted to the specified type. ImageData[image] by default gives a 2D or 3D array whose elements are lists of values for each channel. For a single-channel image, only a value and not a list of values is returned. In 2D, the array generated by ImageData[image] is arranged in the same way that the image is displayed, with the first row corresponding to the top row of pixels in the image. In 3D, the array generated by ImageData[image] is arranged such that the first part corresponds to the top slice, with rows running from back to front, and columns running from left to right. 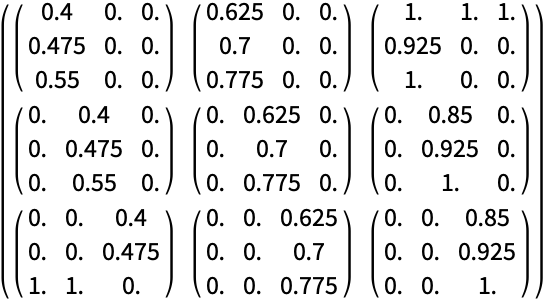 For binary images, ImageData[image] returns integer values 0 or 1. For images of type "Byte" or "Bit16", ImageData[image] always normalizes values to lie between 0 and 1. For images of a real type, ImageData[image] returns whatever real values are used in the image. ImageData[image,Automatic] is equivalent to ImageData[image,ImageType[image]]. ImageData has the option Interleaving. With the default setting Interleaving->True, ImageData returns a 2D or 3D array of lists of channel values. With Interleaving->False, ImageData returns a list of 2D or 3D arrays of values for each channel. Interleaving->Automatic returns in the native form used to store the image. ImageData accepts a DataReversed option. With DataReversed->True, the order of the rows is reversed.